What a beautiful fall we are having. Breathtakingly beautiful days, just the right amount of regular rainfall, cool nights, warm days and this week we are in for some really warm temperatures, a true “Indian Summer”. I have been a planting fool in my own yard. Sunday I started installing shrubs along the newly cleared lower garden. A specimen evergreen was added to my courtyard. I added fall raspberries and everbearing strawberries to one of my raised beds. I popped in a few unusual daylilies in my border along the road. I even dug, divided, and moved around a bunch of perennials. What are youplanting right now? The soil is warm and the root systems of anything you put in the ground will take off. Next year you will be mighty proud of yourself when you see how much nicer your garden has become. Speaking of planting, check out the beautiful cover crop demonstration bed on the south side of Natureworks. Erich installed this as a way to teach everyone the benefit of planting cover crop seeds at this time of year. 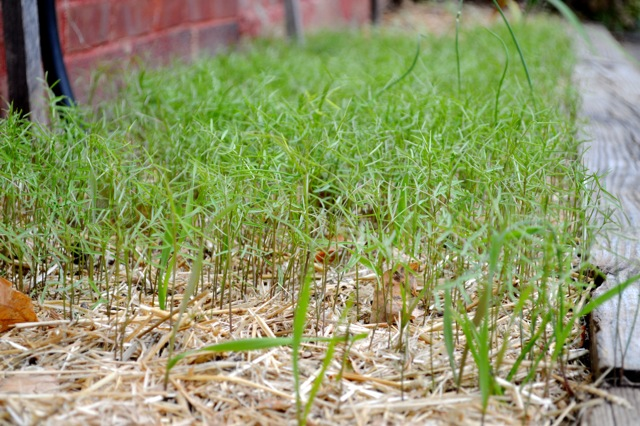 I am still harvesting so much food from my veggie beds but as soon as they are emptied I will be planting winter rye. As I wander around our nursery yard, I see so much beautiful color waiting to be planted this fall. 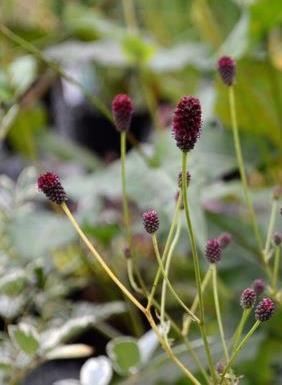 Sanguisorba is such a cool cut flower and is blooming now! We don’t have large numbers of any individual items but we do have a delightful diversity of great plants. 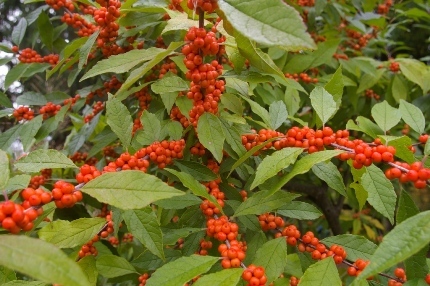 My orange winterberry (Ilex verticillata ‘Fall Gold’) is stunning this year and last I looked, we had this variety as well as red ones and their pollinator ‘Southern Gentleman’. Sanguisorbas are also in their glory now. I have them on the south side of my house and depend on them for late October flower arrangements- like the pumpkin arrangements we will be making Saturday morning in our free workshop Playing with Pumpkins (see details below). We have been spotting lots of monarchs this week. They are gathering and migrating and in the process they are loving the nectar flowers we provide for them. 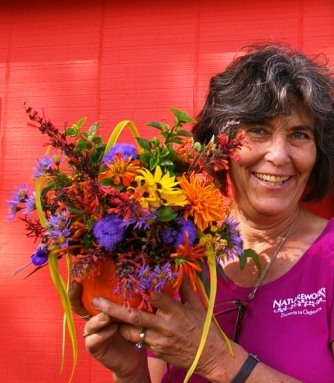 I can’t stress enough the importance of late blooming asters, perennial sunflowers, perennial mums, and more. If you plant it, they will come. This photo was taken last week at the Pauline Spellen Memorial Garden in Madison- a shout out to the Garden Club of Madison who designed and planted the garden. Great job! 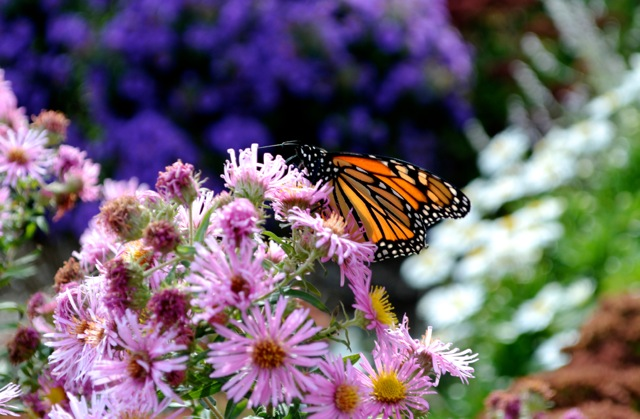 The monarchs and painted ladies and bees were competing for all that yummy nectar. We are gearing up for our Halloween Fairy Festival on Sunday, October 26th. Yes, we still have spots available. Please sign up soon so you won’t be disappointed. 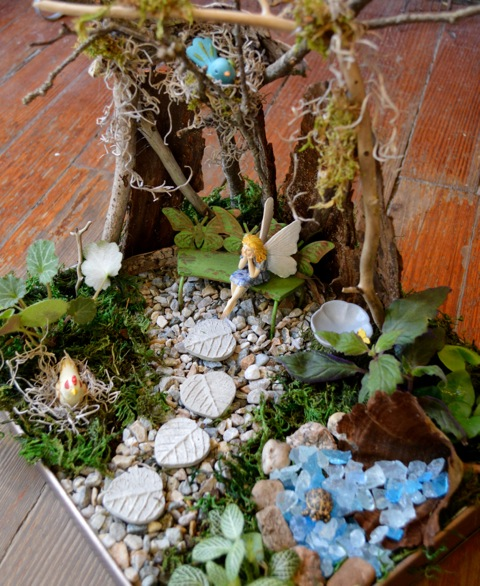 The fairy garden in the above picture was a special order, custom designed for the recipient of this great gift. 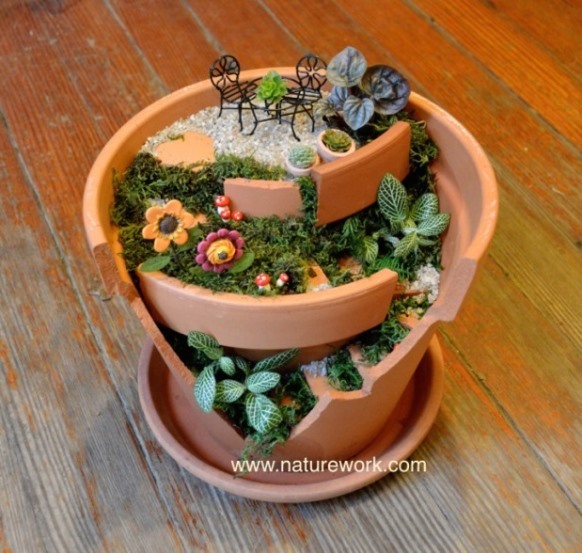 We just got in some new metal planter trays that work really well for indoor fairy gardens. Need I say that we also have lots of miniature plants and all sorts of fun fairy embellishments- of course! This Sunday we are FINALLY having our Broken Clay Pot Workshop. Have you registered yet? The details are below. In December of 2013 I handed Amber a broken clay pot and said “here, do something with this”. She created a garden, complete with clay shard steps. We put this picture up on Facebook and sold the pot. Well! This photo has been viewed around the world so many times! Locally we have been asked over and over to run a workshop and teach others how to do it. This Sunday is it! Details are below. 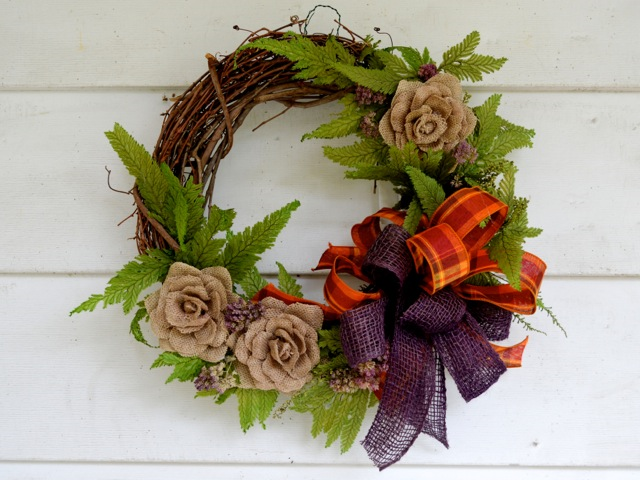 We have also been stocking up on burlap flowers, dried flowers, cool pods, and lots of beautiful ribbons to help you in decorating your home for this lovely fall season. 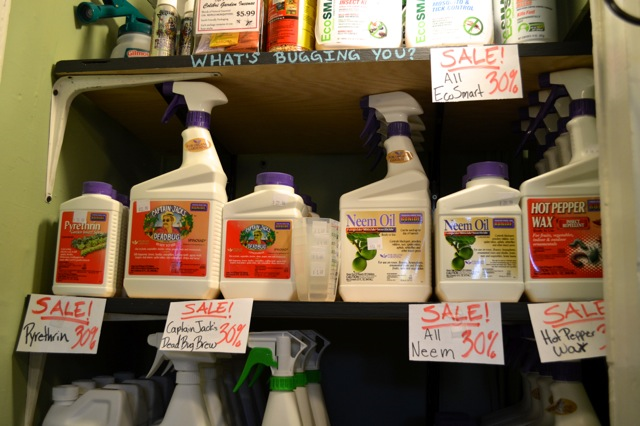 Because we specialize in all-natural decor, we carry very different items than the chain stores. A lot of our materials work well for autumn and can segue nicely into the holiday season as well. Although I am still eating tons of lettuce and escarole from my veggie garden, many folks are turning to growing microgreens and sprouts to provide fresh vitamin-rich nutrition at this time of year. We have a new microgreen seed mix arriving this week, custom designed by our local Hart’s Seed Company representative Sandy Merrill. This mix was tested on all of her friends and relatives! Talk about local… You can get two cuttings out of one sowing. The first cutting are the early greens like radishes, followed by the later greens such as lettuces. We also have many other choices for sprouts and microgreens on our racks. Keep the home grown nutrition coming in your household! The bulb bins are finally starting to shrink and as we empty the boxes: VOILA! My staff instantly creates a new display with freshly delivered merchandise. It is so fun to come into the shop after even a couple of days on the road. It is ever changing. They are BEGGING me to tell you about the crazy salesthey are running on all kinds of really valuable organic fertilizers and pest control products right now. They need the room for-wait for it– giant Amaryllis bulbs, bowls and jars for forcing, and fun gift items. 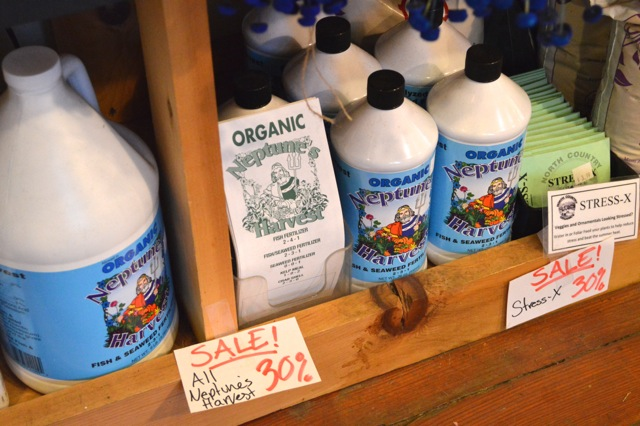 Outside there are many plants on sale along with Penobscot blend compost- ideal to amend the soil when planting shrubs. 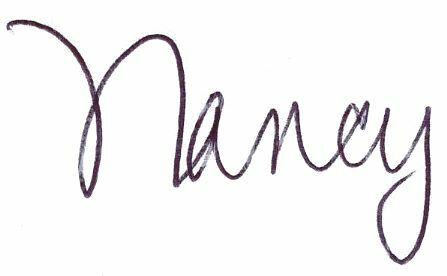 I hope you can stop by for a visit this week. You will find our garden center looking especially beautiful, filled with abundant color during this very special harvest season.